Pioneer DDJ-SB2, Pioneer’s new Portable 2-channel controller for Serato DJ inherits all the amazing features of its predecessor the Pioneer DDJ-SB, yet also adds some amazing new pro-DJ functions. The controller now has 4-deck tactile performance pads and dedicated buttons to switch channels effortlessly, two major upgrades of the DDJ-SB2. The four colour coordinated pads allow you to trigger hot cue, manual loop, auto loop and sampler at the switch of a button. The Pioneer DDJ-SB2 now comes with large jog wheels for a dynamic scratch performance while keeping its compact attractive appearance. Make your play that little more authentic using the DDJ-SB2’s Trim knob. DJkit is excited about this new feature, giving you control over the input volume for each channel. You can guarantee you’ll create mixes that have never been heard before and that your audience will never get bored. Last but not least, thanks to the new filter fade button you have one spare hand to be as creative as you wish. Thanks to the new filter fade button both volume and bass filter can be affected at the touch of a button with just one hand. This new feature of the Pioneer DDJ-SB2 makes seamless mixing effortless even for new DJs. 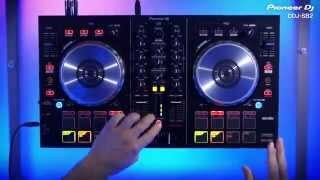 DJkit believes that the Pioneer DDJ-SB2 gives you advanced features that are not usually available at this price point. 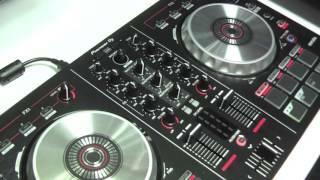 Considering purchasing the Pioneer DDJ-SB2? Have questions? Ask people who've recently bought one. is that software are compatible on my Mac v10.13 ??? Can this be used with Djay, Spotify and an iPhone? I know it’s not ideal, but as a temporary measure until I get my laptop. Does the full bundled package include the full version of serato? Hi looking to get this for my son. First setup and looking to understand if it will play and music straight from Spotify on laptop or iPad? Do you own the Pioneer DDJ-SB2? Why not write a review based on your experience with it. Great deck, Pioneer quality at a reasonable price point! Looks great and offers lots of functionality. Great for â€˜homeâ€™ DJs. Only pick-ups would be that some switch gear could be made to feel higher quality, but I suppose this is already reflected in the price. I also believe full Serato is worth the upgrade price, especially as DJKit offer this at discounted rate. Great piece of kit and just the right amount of "next level" i was looking for. Great product easy to use, I went with the upgrade which was so simple to activate all in all a fantastic deal. Ordered online and someone rang me back. I needed kit for my 12y aspiring DJ son. I thought I ordered this online, but about 30mins later I got a call to confirm the order, at this point the sales person changed some of the kit when I told him what I wanted and who it was for. The end result was a saving of approx Â£40 and some stuff was added in FOC. The sales guy was really good and knowledgeable and knew the products when I questioned the suitability of some other kit. I would use the company again, based on my experience thus far and it cannot be stressed that their sales person on the phone was excellent. Had lots of advice of which bit of kit to buy and this was the forerunner. It is a great piece of equipment, has all the functions I need and many more yet to explore, well made, light and feels rugged. I feel that I made the right choice, and at that price it is a bargain. Great service by DJKit too, superfast delivery! This Is a great piece of equipment for people starting off. Easy to use and set up, and a great price for what you can do with it! Recently upgraded to this controller after using a smaller one for years, and this has really impressed me! Very easy to use on VDJwhich is a bonus for myself, I would highly recommend this bit of kit for anyone looking to get it! Great bit of kit for the bedroom DJ. Got this as an upgrade to a cheap Hercules controller and the difference is vast. This is much better quality in terms of function and build and when comparing it to other controllers of a silimlar price I felt this was by far the best option. The only thing that would make this outstanding is a touch strip to navigate quickly through a track as everything else in Serato can be done on the controller. I would recommend to anyone it has everything I need and more! Fantastic. Easy to set up would recommend. Nice bit of kit. Not keen on serato. I paid for serato upgrade and wish i didnt. But very happy with the controller. Good bit of kit for beginner or intermediate crossing over from vinyl to digital like myself. Works really well with the free serato intro software so no need to buy full version right away and can be quite easily be used with other software if your looking at trying them out. Excellent starter for 15 year old son. Loves it. Good value for money. Am in love with this controller. Got my buzz back for djing again after not owning decks for 6 yrs. Wicked bit of kit does everything & more than i thought it would. 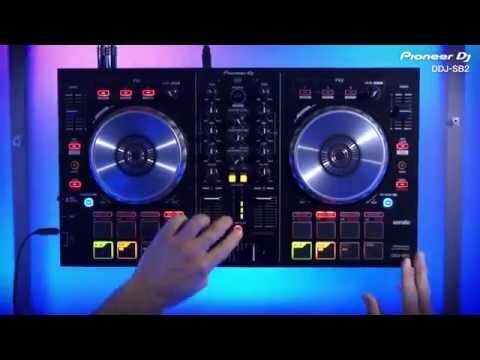 Recommend this Pioneer DJ DDJ-SB2 to everyone. super fast postage, ordered & had it in my hands within 2 days. Awesome controller at an affordable price. What can I say? It is a beautiful controller. It's small but competes with the big ones. I bought this in store and the staff were very helpful in ensuring I had chosen the right product for my needs. It is my first digital console. Took a little while to get used to the static platters but I'm learning quick and its great fun to play with. It's a good quality product and it was up and running straight out of the box after just downloading the Windows driver. Great item at a great price. I had an issue with the original item that got sent to me but the guys at DJ Kit phoned me quickly after I emailed them to asked for more info and arranged the collection of the faulty item the very next day and at the same time dropped off a brand new replacement item. Cannot fault the customer service shown by DJ Kit and I have already recommended to a few friends. The controller itself is good if you want to travel light and it is easy to use. I couldn't get it working with my full version of Serato DJ but got it working on a free version of Serato Intro I downloaded. The jog wheel has a bit of weight to it and doesn't feel too plastic. The buttons have a nice feel to them. If I was to pick a bad point I'd say the tempo sliders aren't the greatest and it's quite difficult to get the tempos to match perfectly without using the sync button but other than that it's a pretty well rounded controller and would be a great addition to anyone's kit. Absolutely brilliant. Great price. Easy to use. Amazing bit of kit. The best toy I've ever had. It's been a fair few years since I've laid my hands on some decks but these make it seem like I was never away. This is a great product at a great price, good for beginners like me. really happy does everything i want and more plus really easy to order and arrived really quick over the christmas period too. Overall very satisfied. Fantastic controller and at a great price. Does everything you need to get mixing if like me used to use vinyl turntables. Also with the upgrades from the SB, Pioneer have made a great controller. Recommended! Bought for my son who rates it highly. Best in its price range. Great piece of equipment, really easy to master, good build quality, lots of features to play with, can easily make a novice look like a professional. After my friend purchased the next model up from this controller , I was a bit worried about it not being as good but was pleasantly surprised to find it just as fun to mix , with a decent amount of effects and such. Being predominantly a vinyl dj for the last how ever many years I have found it absurdly easy to mix with , theres even sync buttons for those unable to beat match so even a complete novice could start mixing straight away ! Overall I'm happy , plus the price was the cheapest I could find, delivery was prompt also . Been using a mouse and an old programme to mix for a while so the time had come to buy something better. This is ideal. The only downfall is serato. It's £60 for the full programme which allows you to record, but you get the lite edition which doesn't allow you to record. The mixer says comes with serato, but you get the website address where anyone can download it. Other than that, I love it. Great product and value especially with the free downloads. Not been able to use them yet as I don't have any speakers, but the product is great as well as the features! Wanted to get into DJing for a few years now, but was always intimated like most beginners by the number of knobs, levers, buttons etc, in the end I thought it was time to give it a go. This controller is perfect for beginners, as it mainly consists of the basic features on a controller, allowing you learn the basics first & gain confidence for using more advanced controllers further down the line. Made by the most popular manufacturer Pioneer, so you know what you pay will definitely be worth it. Works excellently with the software Serato. (Was also very impressed by how responsive the aluminium jog wheels are). All in all I'd give this entry level controller a solid 9/10. Without doubt this is a great piece of kit. For quality and ease of use it would be hard to find a comparable product at this price. Has many extras and I am grateful to the staff at DJ Kit for the quick run-through prior to purchase. I brought the sb2 as a beginners controller, this is an excellent piece of kit to get your foot in the door for serious beginner djs, the checkout and delivery was A+! Super fast next day delivery! Great Product. Great value for money for first controller. I called up to enquire about this as a present for someone at 1pm on Friday for birthday present needed Monday. Spoke to a really cheery, helpful guy. I placed the order and got an email within 20 minutes to say my item had been dispatched. Arrived first thing Monday morning. Great Service. Great piece of kit much better than the first ddj-sb as it has control over the gain and allows 4 deck mixing. 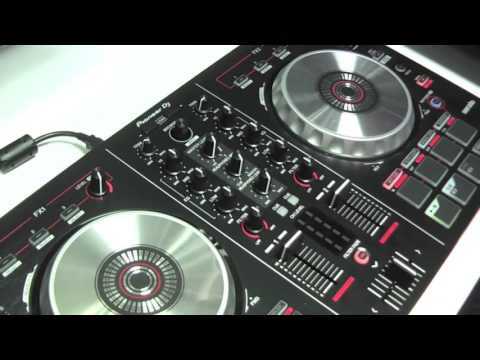 Seen a video for Pioneer DDJ-SB2 online or have you own video? 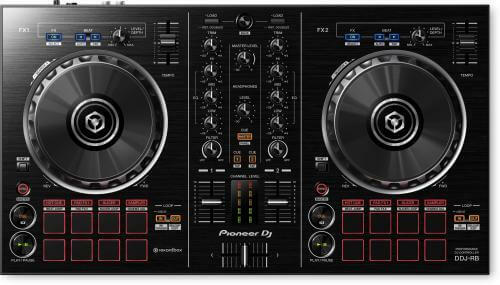 Check out Pioneer DDJ-SB2 on DJkit.com!